Call queues are used to distribute calls to the agents subscribed to the queue. Queues are managed on the Services ‣ Call Center ‣ Queues page. On-Hold music: The music the caller will hear. The music is played when waiting and when the call is on hold. When editing a queue, you can’t change the ring strategy to linear. This is due to an asterisk limitation. Unfortunately, if you want to change the ring strategy of a queue to linear, you’ll have to delete it first and then create a new queue with the right strategy. 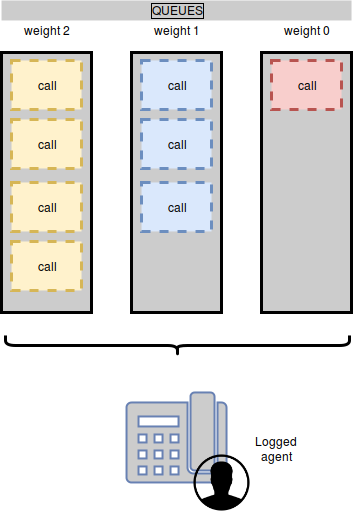 When an agent is a member of many queues, configured with the same weight, the order of call distribution between multiple queues is nondeterministic and cannot be configured. In order to have a deterministic behavior, you MUST configure different weight on each queues. Member reachabillity time out (Advanced tab): Maximum number of seconds a call will ring on an agent’s phone. If a call is not answered within this time, the call will be forwarded to another agent. Time before retrying a call to a member (Advanced tab): Used once a call has reached the “Member reachability time out”. The call will be put on hold for the number of seconds alloted before being redirected to another agent. 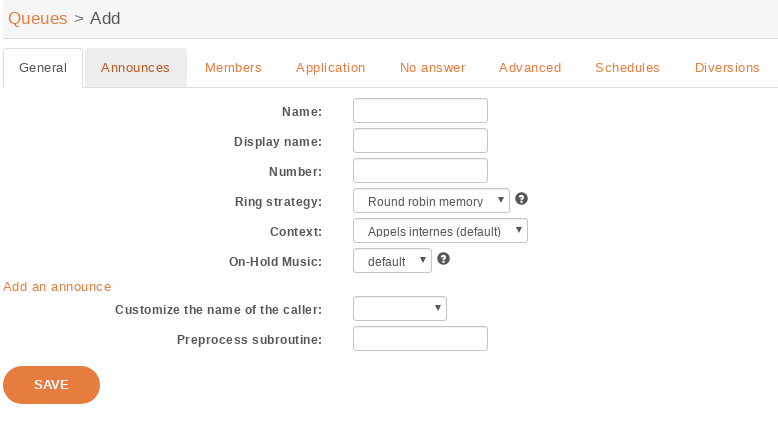 Ringing time (Application tab): The total time the call will stay in the queue. Timeout priority (Application tab): Determines which timeout to use before ending a call. 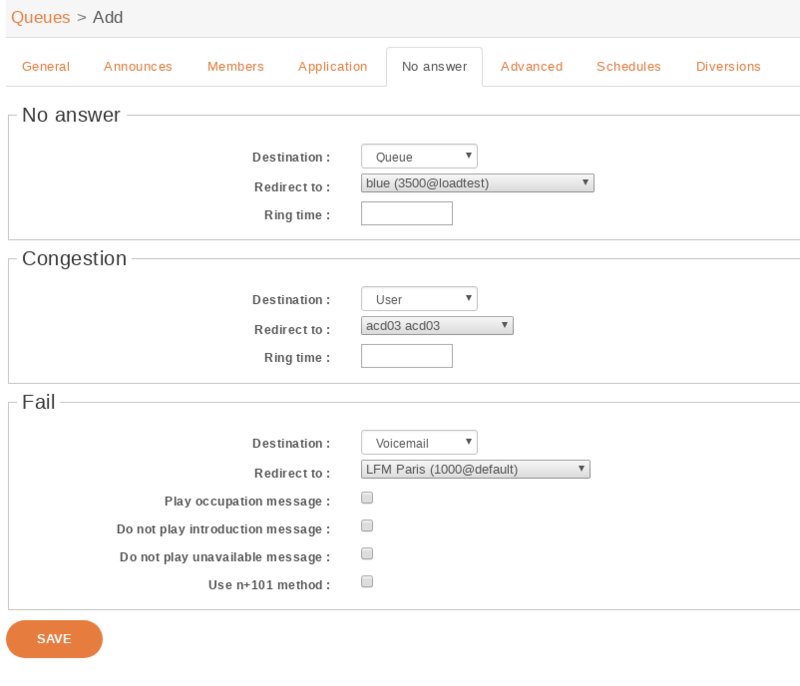 When set to “configuration”, the call will use the “Member reachability time out”. 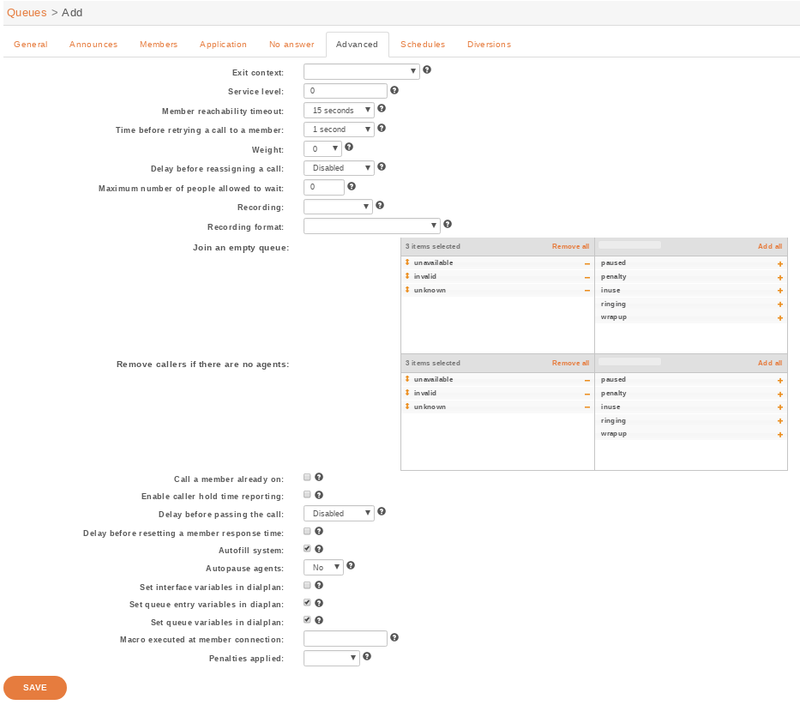 When set to “dialplan”, the call will use the “Ringing time”. Weight: Give the queue a priority to others queues (if agents belong to two or more queues). Check weight warning for explanation. When configuring a queue with a higher weight, all the calls in this queue will be prioritized over the calls of other queues if they they have the same set of members. Here, the red call must wait end of orange and green calls. Even if the red calls ring agent first, if for some reasons agent did not answer red call, the red call will have to wait for orange and green. If some others orange or green calls come after, red call will also have to wait. Actually, red call must wait that queue of weight 2 and queue of weight 1 be completely empty. The diversion check is done only once per call, before the preprocess subroutine is executed and before the call enters the queue. In the following sections, a waiting call is a call that has entered the queue but has not yet been answered by a queue member. When this scenario is used, the administrator can set a destination for calls to be sent to when the estimated waiting time is over the threshold. Note that if a new call arrives when there are no waiting calls in the queue, the call will always be allowed to enter the queue. the estimated waiting time of a queue is updated only when a queue member answers a call. When this scenario is used, the administrator can set a destination for calls to be sent to when the number of waiting calls per logged-in agent is over the threshold. The number of waiting calls includes the call for which the check is currently being performed. The number of logged-in agents is the sum of user members and currently logged-in agent members. An agent only needs to be logged in and a member of the queue to participate towards the count of logged-in agents, regardless of whether he is available, on call, on pause or on wrapup. 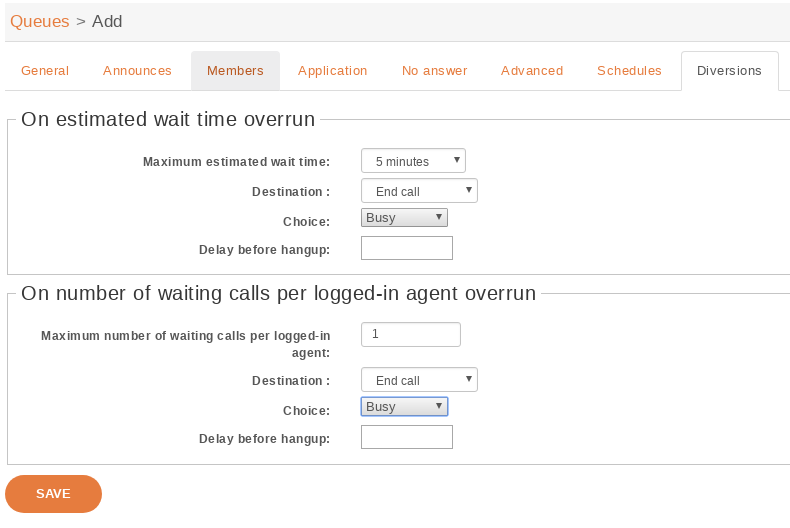 The maximum number of waiting calls per logged-in agent can have a fractional part. Even if the number of waiting calls per logged-in agent (1) is greater than the maximum (0.5), the call will still be accepted since there are currently no waiting calls.